Two snobbish art-collecting aliens arrive in Florence and begin stealing great works of art, while the Turtles and April are there. The citizens blame the Turtles for the theft, and after being defeated in their efforts to stop the aliens, the TMNT must escape an angry mob. The Turtles again run into the aliens, who are ecstatic when they learn their names are Michelangelo, Leonardo, Donatello and Raphael — and decide to take these great artists back to their planet! April broadcasts from the Roman Coliseum, trying to lure the aliens into draining their ship’s energy by beaming up the gigantic structure. 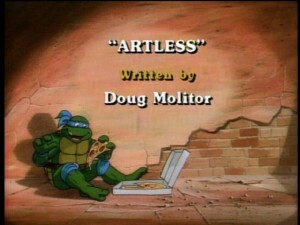 The Turtles get free, and with Splinter’s help convince the aliens that the artworks they stole are counterfeits. Disgusted, the aliens return the works and head for home.